But real estate experts don't expect an immediate impact. Reported plans by Amazon and Google to hire more highly paid tech workers in New York would send already high housing costs higher on Long Island, real estate experts said. But the impact won't be immediate because the workers wouldn't surge into the city all at once, and other areas would also absorb many of the newcomers. “I think that the bulk of the pressure on housing prices will be in the city, but [Nassau County] is certainly close enough to feel some heat," said Jonathan Miller, president and CEO of Miller Samuel Real Estate Appraisers, based in Manhattan. Amazon.com, the Seattle-based e-commerce giant, is reportedly close to naming Long Island City in Queens and Crystal City, Va., as the two locations that will get new Amazon headquarters — and house up to 50,000 employees combined — The New York Times reported this week, citing anonymous sources. So far, Amazon has declined to comment, and other reports say Dallas is still in the running for one of the two sites. Tech giant Google may also expand its employment in New York by 12,000, The Wall Street Journal reported this week. The rising price of homes in northwestern Queens is already pushing home buyers to Long Island, said Nick Sakalis, a real estate agent in the Syosset office of Coldwell Banker Residential Brokerage. “The places that are aligned with the LIRR have done well because of this. Those that are further out — and further out east — have not benefited the same,” he said. Over the third quarters of 2013 to 2018, the median sales price of homes rose 54.2 percent to $573,500 in Queens and 25.3 percent to $859,000 in Long Island City, according to Miller Samuel. In Nassau County the price rose 23 percent to $535,000, while it rose 17.8 percent to $382,750 in Suffolk County, excluding the Hamptons. Rising prices would benefit existing homeowners, and pose yet another hurdle for those looking to buy. 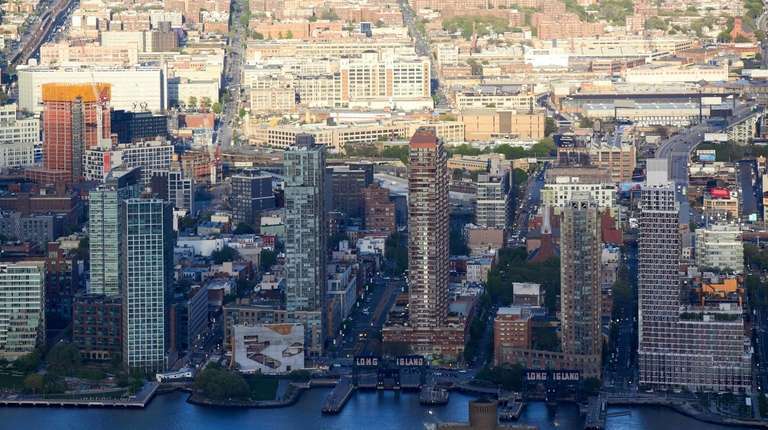 The 3.3 percent rental vacancy rate in the northwestern Queens market, which includes Long Island City, Astoria, Ditmars, Sunnyside and Woodside, is low compared to the area's historical average, said Adin Perera, a market analyst for CoStar Group Inc., a Washington, D.C.-based real estate information company. The area’s number of new market-rate rental units has increased by 7,500, or 16.5 percent, to 53,000 units since the start of 2017, he said. However, it is still a very impressive vacancy rate due to the amount of new construction added over the last couple of years, he said. “It’s one of the fastest-growing areas in the country, and certainly in the New York metro area, for apartment growth,” he said. In Amazon’s September 2017 request for proposals for possible sites for its second headquarters site — at the time it was seeking a single site — it said the property would house employees whose average annual salaries would exceed $100,000 over the next 10 to 15 years. The jobs likely would be executive/management, engineering with a preference for software development engineers, legal, accounting, and administrative. Long Island communities, such as Patchogue, Bay Shore, Farmingdale and Mineola, have been doing well in reinventing themselves and creating smart-growth, transit-oriented developments, but more of that — and diverse types of housing — is needed to retain current residents and attract new ones, said James Britz, executive vice president of the Long Island Housing Partnership, a Hauppauge-based nonprofit that develops affordable housing and provides counseling and education to low- and moderate-income clients. It’s difficult for developers to create affordable housing on Long Island because of the cost of living, taxes and insurance, Britz said. Long Island housing stock is 20 percent rental and 80 percent owner-occupied, Britz said. The rental percentage ranges from 35 percent to 45 percent in surrounding suburbs in New Jersey, Connecticut and Westchester, he said.